LMI: Surface Track Inspection - Allied Automation, Inc. 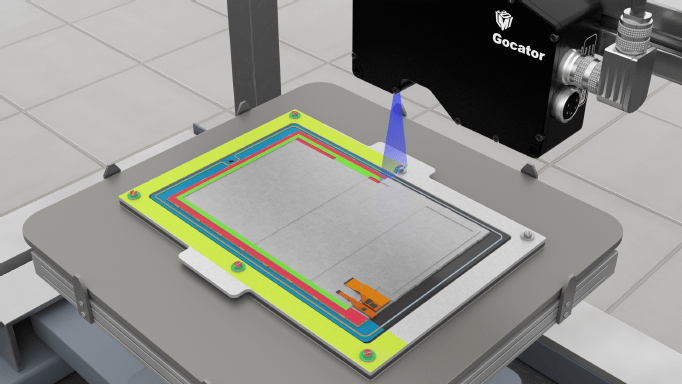 The built-in Surface Track tool in Gocator® lets you perform quality control and inspection along the path that you define based on representative scan data. This tool is especially useful for inspecting materials such as glue and sealant beads. Using a separate, PC-based utility called the “track editor”, the user defines the path along which the tool will perform its internal measurements. You use this track editor to configure “path” and “ruler” information on scan data from a Gocator® sensor. Dots with other colors provide additional information. For example, red dots show center points on rulers that fail at least one of the criteria set in the tool. These count toward the “No Good Count” measurement. Green dots show center points on rulers that pass the criteria set in the tool. These count toward the “OK Count” measurement. Orange dots show the peak (highest) point on the ruler. Call us at 800-214-0322 for more info on our LMI Technologies solutions.